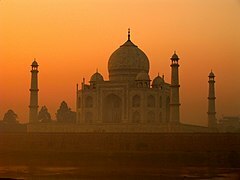 ↑ Wells John C. (1990)։ Longman pronunciation dictionary։ Harlow, England: Longman։ էջ 704։ ISBN 0-582-05383-8 entry "Taj Mahal". ↑ 'Abd al-Hamid Lahawri Badshah Namah Ed. 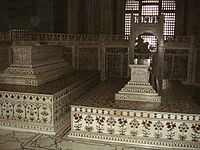 Maulawis Kabir al-Din Ahmad and 'Abd al-Rahim under the superintendence of William Nassau Lees. Vol. I Calcutta 1867 pp. 384-9 ; Muhammad Salih Kambo Amal-i-Sal\lih or Shah Jahan Namah Ed. Ghulam Yazdani Vol.I (Calcutta) 1923 p. 275. ↑ Chaghtai Le Tadj Mahal p54; Lahawri Badshah Namah Vol.1 p. 403. ↑ Gascoigne, Bamber (1971). The Great Mughals. New York:Harper&Row. p. 243. ↑ Lord Curzon's Brass Lamp Archived 1 February 2009 at the Wayback Machine..
↑ Yapp, Peter (1983). The Traveller's Dictionary of Quotations. London:Routledge Kegan & Paul. p. 460. ↑ Acid Rain and the Taj Mahal Archived 1 February 2009 at the Wayback Machine..
↑ Oil Refinery Impact on Taj Mahal Archived 14 May 2009 at the Wayback Machine..
↑ Tillitson, G.H.R. (1990). Architectural Guide to Mughal India, Chronicle Books. ↑ Taj Mahal Calligraphy Archived 1 December 2016 at the Wayback Machine..
↑ 40,0 40,1 Koch, p. 100. ↑ Allan John (1958)։ The Cambridge Shorter History of India (First ed. )։ Cambridge: S. Chand, 288 pages p. 318. 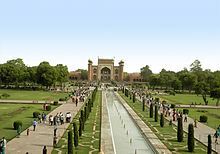 ↑ The Taj by Jerry Camarillo Dunn Jr Archived 13 September 2007 at the Wayback Machine..
↑ DNA India: Going to the Taj? This is all you can carry Archived 14 January 2008 at the Wayback Machine..
↑ Warrior Empire: The Mughals of India (2006) A+E Television Network. ↑ 69,0 69,1 Koch, p. 239. ↑ Rosselli, J., Lord William Bentinck the making of a Liberal Imperialist, 1774–1839, London Chatto and Windus for Sussex University Press 1974, p. 283. ↑ Writ Petition (Civil) 336 of 2000, P.N. OAK vs. U.O.I. & Ors. 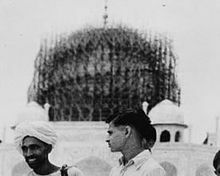 ↑ Siraj Qureshi, "Another court petition challenges Taj Mahal's story as a symbol of love" Archived 16 October 2017 at the Wayback Machine., India Today, 12 August 2017. 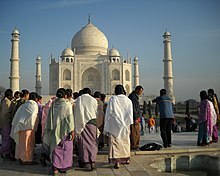 ↑ "Is Taj Mahal a mausoleum or a Shiva temple? CIC asks govt to clarify" Archived 26 August 2017 at the Wayback Machine., Hindustan Times, 10 August 2017. Asher, Catherine B. Architecture of Mughal India New Cambridge History of India I.4, Cambridge University Press 1992 0-521-26728-5. Carroll, David (1971). 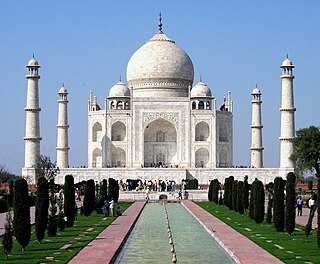 The Taj Mahal, Newsweek Books 0-88225-024-8. Rothfarb, Ed (1998). In the Land of the Taj Mahal, Henry Holt 0-8050-5299-2.